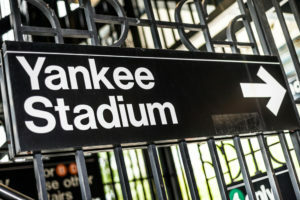 Wednesday, 9/27; game time 7:05 p.m., Networking 5:30 – 7 p.m.
SUNY is sponsoring its 6th Annual Alumni Night at Yankee Stadium, which includes a time for networking, plus all-you-can-eat ballpark food and beverages, including Pepsi products, wine and beer; and the game. The Yanks are playing the Tampa Bay Rays. Act now because there are only 500 tickets available, at a price of $89. For more information and to purchase a ticket, visit suny.edu/events/baseball.